The Mini IAQ Profile system has been designed to give a visual representation of indoor air quality in buildings, as part of the buildings management standards in relation to conditions such as Sick Building Syndrome. Since a great number of units can be networked, the system can show prescise changes in concentration of selected IAQ parameters in various locations over time. The Mini IAQ Profile Monitor system enables the user to control and run several different wireless IAQ sampling units — all communicating together via the sophisticated and reliable ZigBee wireless mesh system. The mesh network system is costeffective, easy to install and simple to use: the nodes which make up the mesh automatically configure the optimal signal route. Other advantages of a wireless mesh system is that it is self healing meaning that the network can still operate even when a node breaks down or a connection goes bad. As a results, a very reliable network is formed. The size of the wireless mesh can be easily extended by simply adding new Mini IAQ Monitor units or even the larger IAQ monitor units, as each one is also a router for it's neighbours. 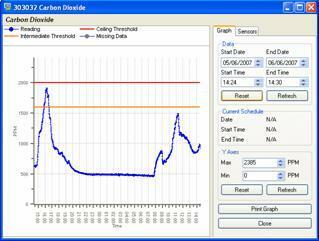 In areas where no IAQ monitoring is required then dedicated "Repeater" nodes can be used for the same purpose. Power Amplified Wireless Modules are also available, these have more powerful antennae to considerably increase the transmission distance and consequently reducing the need for repeaters and simplifying the network. The Mini IAQ Profile Monitor incorporates a variety of advanced gas sensor technologies to monitor the target gases including NDIR, PID and Electrochemical and is available in four main configurations, all of which can be networked together. A wireless Htv or Glutaraldemeter solution, which can be used to monitor airborne formaldehyde or Glutaraldehyde levels in a building. Also provides monitoring of temperature and humidity levels within the area. Additional relay option to allow control of alarm and airconditioning systems. Allows for monitoring of temperature and humidity levels within a building. Can be networked with other mini wireless units and IAQ monitors on the Zigbee mesh network. A dedicated wireless system with 3 inbuilt relays to control various outputs such as audible/ visual alarm systems and other third party systems. Screenshots from the Mini wireless Sensor Unit.